J.E.E. NEW ENVIRONMENTAL BOOKLETS – FREE!! NEW ENVIRONMENTAL BOOKLETS – FREE!! Japan Environmental Exchange (J.E.E.) 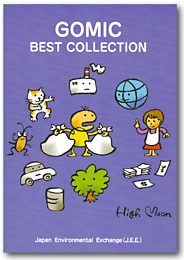 has published two new English booklets, in full color. How to Reduce Waste, Recycle and Dispose of Garbage in Kyoto City explains how to reduce waste, recycle and separate household garbage for collection. 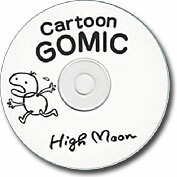 Gomic Best Collection features 60 of High Moon’s environmental cartoons, in print and on a bonus CD-ROM! Please enjoy these great cartoons and make use of them yourself for environmental education or public awareness-raising. (If you do use them, please let J.E.E. know the details). 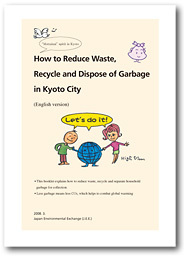 These booklets are free, by courtesy of a subsidy from Kyoto City government’s Organization for the Promotion of Waste Reduction in Kyoto. To order copies, please fill the form below and mail it to J.E.E., together with an 80 yen postage stamp.